Not to be confused with Parliament (band), Funkadelic, or P-Funk. Parliament-Funkadelic (abbreviated as P-Funk) is an American funk music collective of rotating musicians headed by George Clinton, primarily consisting of the individual bands Parliament and Funkadelic, both active since the 1960s. 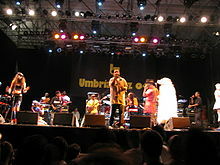 Their distinctive funk style drew on psychedelic culture, outlandish fashion, science-fiction, and surreal humor; it would have an influential effect on subsequent funk, post-punk, hip-hop, and post-disco artists of the 1980s and 1990s, while their collective mythology would help pioneer Afrofuturism. The collective's origins date back to the doo-wop group the Parliaments, formed by Clinton in the late 1950s in Plainfield, New Jersey. Under the influence of late-1960s artists such as Jimi Hendrix, Sly Stone, and Frank Zappa, Clinton later relocated to Detroit and began the sister groups Parliament and Funkadelic, with the former playing an eclectic and more commercial form of funk, and the latter incorporating more influence from psychedelic rock. The groups released albums such as Maggot Brain (1971), Mothership Connection (1975), and One Nation Under a Groove (1978) to critical praise, and scored charting hits with singles such as "Give Up the Funk" (1976), "One Nation Under a Groove" (1978), "Flash Light" (1978), and "Atomic Dog" (1982). Overall, the collective achieved thirteen top ten hits in the American R&B music charts between 1967 and 1983, including six number one hits. The West End of Plainfield, New Jersey was once home to the Silk Palace, a barbershop at 216 Plainfield Avenue owned in part by Clinton, staffed by various members of Parliament-Funkadelic and known as the "hangout for all the local singers and musicians" in Plainfield's 1950s and 1960s doo-wop, soul, rock and proto-funk music scene. George Clinton and Parliament-Funkadelic at the Roskilde Festival, 2006. The 1996 album T.A.P.O.A.F.O.M. 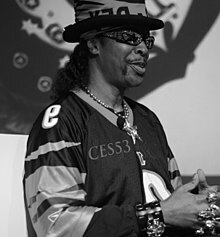 (The Awesome Power of a Fully Operational Mothership), released under the name George Clinton & the P-Funk All Stars, served as a reunion album featuring contributions from the band's most noteworthy songwriters from the earlier eras, such as Bootsy Collins, Bernie Worrell, and Junie Morrison. It would be ten years before another album would be released. In the intervening time, successive tours would slowly restore some of the broken ties between the original band members, together with an accumulation of new talent. On July 23, 1999, George Clinton and Parliament-Funkadelic, including noteworthy former members Bootsy and Catfish Collins and Bernie Worrell, performed on stage at Woodstock '99. The collective continued to tour sporadically in to the 2000s, with participation from some of the children and grandchildren of the original members. In May 1997, George Clinton and 15 other members of Parliament-Funkadelic were inducted into the Rock and Roll Hall of Fame, the largest band yet inducted. In 2004, Rolling Stone ranked Parliament-Funkadelic #56 on their list of the "100 Greatest Artists of All Time". In February 2002, Spin ranked Parliament-Funkadelic #6 on their list of the "50 Greatest Bands of All Time". In 2010, Parliament-Funkadelic was #49 on VH1's list of the greatest artists of all time. P-Funk's effect on modern popular music is immense. Besides their innovation in the entire genre of funk music, George Clinton and P-Funk are still heard often today, especially in hip-hop sampling. The song "Atomic Dog" is one of the most sampled songs in the history of hip hop, especially in the subgenre G-funk. The Red Hot Chili Peppers video for their 2006 single "Dani California" featured a tribute to Parliament-Funkadelic. Parliament-Funkadelic's musical influence can also be heard in rhythm and blues, soul, electronica, gospel, jazz, and new wave. Parliament-Funkadelic was inducted into the Michigan Rock and Roll Legends Hall of Fame in 2013. In December 2018, the Recording Academy announced that Clinton and Parliament-Funkadelic would be given Lifetime Achievement Awards. The awards will be presented on May 11, 2019. About the album Mothership Connection, Clinton said “We had put black people in situations nobody ever thought they would be in, like the White House. I figured another place you wouldn't think black people would be was in outer space. I was a big fan of Star Trek, so we did a thing with a pimp sitting in a spaceship shaped like a Cadillac, and we did all these James Brown-type grooves, but with street talk and ghetto slang.” Like Sun Ra, Clinton wanted to see black people in space. Walter “Junie” Morrison (keyboards, multi-instrumentalist, vocals, songwriter, arranger, producer; born 1954 - January 21, 2017 ). Junie Morrison joined P-Funk in early 1978 as musical director after having success in the early Ohio Players and as a solo artist. Though primarily a keyboardist, Junie composed or co-wrote several of the band's hits at the height of their popularity and served as a lead vocalist, producer, and arranger on many songs for the collective. Morrison stopped touring with the band after 1981, but contributed to many subsequent albums. During his time with P-funk, some of his work was credited under the name J.S. Theracon. ^ Bush, John. "Parliament -Biography & History". AllMusic. Retrieved January 26, 2018. ^ Parliament/Funkadelic. (2009). In Student's Encyclopædia Archived April 21, 2009, at the Wayback Machine: "Combining funk rhythms, psychedelic guitar, and group harmonies with jazzed-up horns, Clinton and his ever-evolving bands set the tone for many post-disco and post-punk groups of the 1980s and 1990s.". Retrieved August 15, 2009, from Britannica Student Encyclopædia. ^ Echard, William (2017). Psychedelic Popular Music: A History through Musical Topic Theory. Indiana University Press. pp. 123–125. Retrieved January 26, 2018. ^ Bush, John (July 22, 1940). "George Clinton - Music Biography, Credits and Discography". AllMusic. Retrieved September 25, 2012. ^ Sammy Campbell and the Del Larks - Classic Urban Harmony. classicurbanharmony.net/wp-content/uploads/.../Sammy-Campbell-The-Del-Larks.pdf by T Ashley. The story of the Del Larks revolves around the extensive music careers of two individuals; Sammy. Campbell and Ron Taylor. 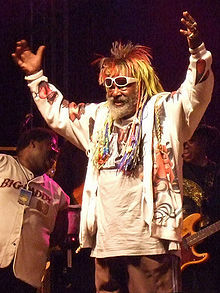 ^ "George Clinton and the Parliaments – (Part One of Two) – Rock 'n' Roll Spotlight". www.rocknrollspotlight.com. ^ Johnson, Gary. "Michigan Rock and Roll Legends - PARLIAMENT - FUNKADELIC". www.michiganrockandrolllegends.com. ^ Hertweck, Nate (December 19, 2018). "Dionne Warwick, Donny Hathaway & More To Receive Special Merit Awards". The Recording Academy. Retrieved January 6, 2019. ^ Aniftos, Rania (December 19, 2018). "Black Sabbath, George Clinton & Parliament-Funkadelic Among Recording Academy Lifetime Achievement Award Recipients". Billboard. Retrieved January 6, 2019. ^ Grow, Kory (December 19, 2018). "Black Sabbath, George Clinton to Get Lifetime Achievement Grammys". Rolling Stone. Retrieved January 6, 2019. 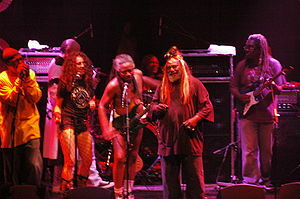 Wikimedia Commons has media related to Parliament-Funkadelic.